I was surprised to discover this burst of color in the southern border early this July Fourth. I inherited this daylily several years ago when my daughter moved and could not take her plants. This is the first time it has bloomed in my garden. Not really knowing its name I nicknamed it Fireworks just for today as a nod to Independence Day and the streams of color that will fill the night sky. I will have to check with my daughter but I think this is one she selected at Roger Mercer’s daylily farm. The closest match I could find on his website was ‘Black Jade’ but it is certainly not one unless by accident as the price listed was $200. Another nameless daylily, this sunny yellow, ruffly one I selected during the same daylily farm visit. Sometimes the color seems almost tangerine but not sure I would describe it as such this year. I know very little about daylilies but am becoming more interested in them this year. 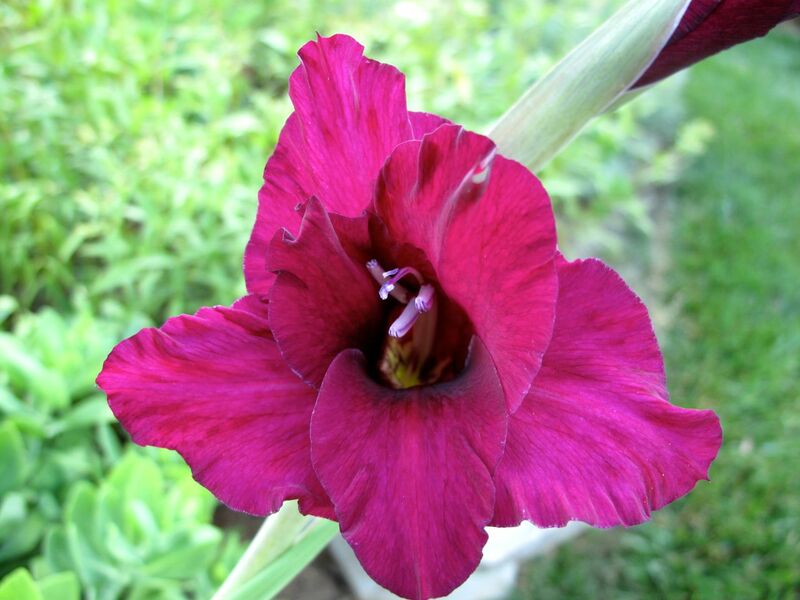 And one more thing—I could not resist showing the first flower that has opened at the bottom of this gladiolus spike. With its nice clear magenta hue it really stood out against the grass and sedum below. 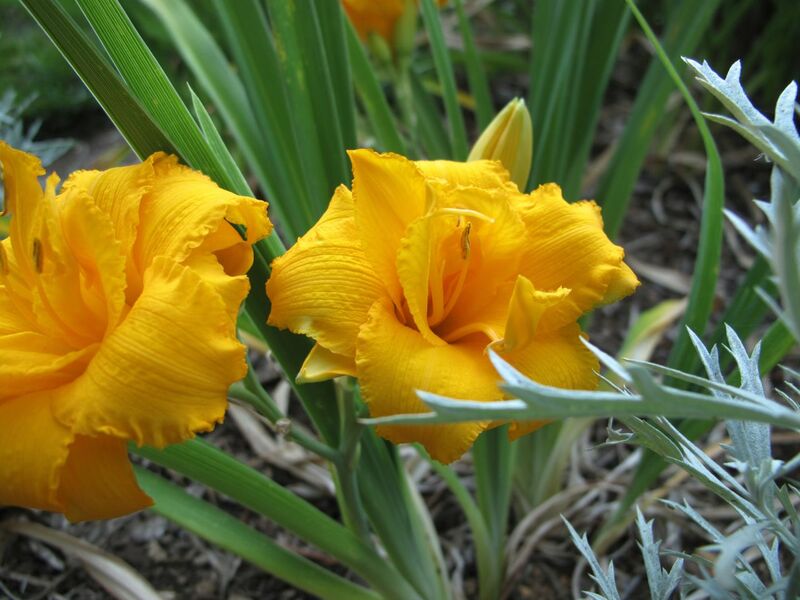 This entry was posted in garden and tagged gladiolus, Hemerocallis (Daylily) on July 4, 2014 by pbmgarden. Happy 4th of July in a beautiful garden! Thank you Stepheny–Happy Fourth to you too! I have had one that dark named ‘Obsidian,’ which could be a candidate. Happy 4th! Thanks John, I’ll look that up. The name, ‘Obsidian,’ sounds appropriate! You certainly do have a fireworks of color in your yard and they are all beautiful. Don’t you love thinking about the person who would pay $200 for a day lily? LOL I live down the road from a day lily farm. Now one would think that is a good thing, and it is except I’ve bought some beautiful plants there and never recorded the names. Oh well, I enjoy their blooms even if they are nameless. Happy 4th. It would be dangerous for me to live too close to any place that sells plants. I think I became more interested in the names of my plants when I started blogging. I still can’t remember them all but most are recorded for reference. You’re right though, they can beautiful even without names. The flower that you nicknamed “Fireworks” is absolutely beautiful! Thanks Jada. I was surprised to see it this morning. The color is so dark and rich. No problem, yes I absolutely loved it! Really lovely colours in all your flowers, the dark day lily is so impressive. Have a happy 4th July. Thanks Pauline. Hope you’re having a good day. I am excited to have such an exotic looking day lily today. 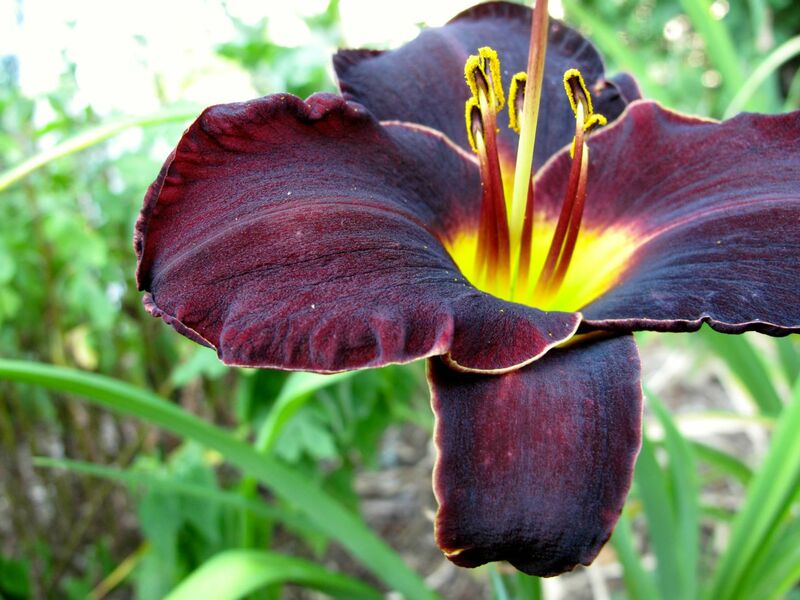 What a gorgeous colour that dark Day Lily is. Really sumptuous! I agree Chloris. Wouldn’t that make a nice iris color? 200 dollars for a lily? Wow, who pays that kind of money?! It is a beauty. I saw a short report on TV this evening about a man here in Bavaria who has 700 sorts and cross pollinates them to produce new variations. Apparently there are 55,000 different recognized day lilies and that number is growing all the time! Happy 4th of July Susie! 55,000? That is mind-boggling. It would be interesting to understand more about the characteristics that make each of these unique and interesting. Your maroon daylily is very dramatic, and I like the yellow. My garden could use a bit more drama these days. I like the way the yellow holds up in this heat–really keeps its color well. That is some color! So nice and saturated, I love it. Visiting a day lily farm and picking a couple out sounds like a fun trip. If you ever get a chance I recommend it. My sister invited my daughter and me to visit this day lily farm near her and we had such a fun time. Happy 4th! The ‘Fireworks’ nickname fits perfectly. Thanks! It would be fun to know what the real name is but is there such a thing as poetic license for gardeners? Fireworks is such a cracker! I love this colour in daylilies and have two dark red ones which are in need of being identified. It’s a little annoying that you often get the wrong plants when ordering because initially I had ordered “Stafford”. Never mind we’ll keep enjoying our nameless varieties…might be just as well considering the sometimes weird names the breeders come up with! Annette, I just looked up Stafford and it is a beauty. I would be happy with more dark red ones, but you’re right–it is frustrating to not receive the correct plant you’ve ordered. 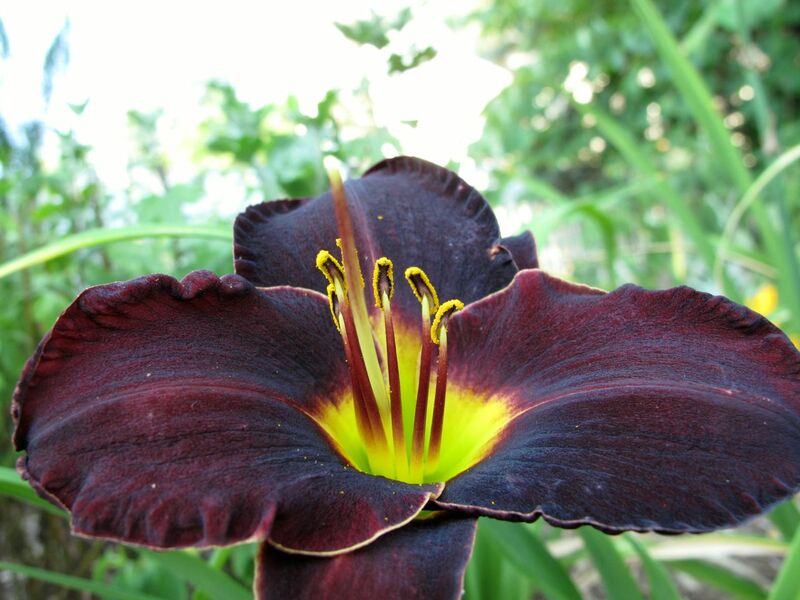 I love the dark purple daylilies and have a few….I am always surprised when the daylilies show up with their dramatic color. 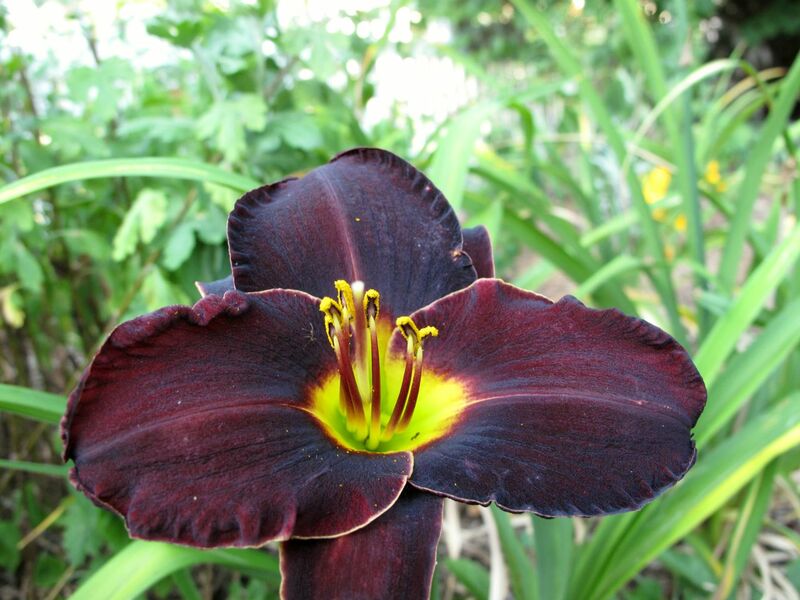 Your dark purple daylilies sound very special. Hope you’ll post photos. I think your small yellow ones are Stella d’Oro; not sure, but I would say that’s it!